North Korea’s foreign minister says Pyongyang’s position will not change even if the US seeks further talks. Ri Yong Ho was speaking after a summit in Vietnam between US President Donald Trump and North Korean leader Kim Jong-un ended without agreement. Mr Trump said the US had refused demands for all sanctions to be lifted. But at a late-night news conference, Mr Ri insisted the North had only asked for partial sanctions relief, not a complete lifting. “This proposal was the biggest denuclearisation measure we could take at the present stage when taking into consideration the current level of confidence between the DPRK [North Korea] and the United States,” he said. In return, Mr Ri said, the North had wanted only partial lifting of sanctions “that hamper the civilian economy and the livelihood of our people”. He said Pyongyang had also offered to permanently halt nuclear and long-range rocket testing. He added that it might be hard to see an opportunity such as the Hanoi summit again. “Our principal stand will remain invariable and our proposals will never change, even if the United States proposes negotiations again in the future,” Mr Ri told reporters. The two leaders had been expected to announce progress on denuclearisation of the Korean peninsula and to sign a joint agreement. But at a news conference after the summit broke up, Mr Trump said: “It was all about the sanctions. They wanted the sanctions lifted in their entirety and we couldn’t do that. President Trump later reassured his Japanese and South Korean counterparts that talks with the North would continue. On the flight back to the US he spoke for about 15 minutes each with Japanese Prime Minister Shinzo Abe and South Korean President Moon Jae-in, White House press secretary Sarah Sanders said. On the same flight, Secretary of State Mike Pompeo said he was hopeful that officials from both sides could resume talks before too long. “My sense is it’ll take a little while. We’ll each need to regroup a little bit,” he said. 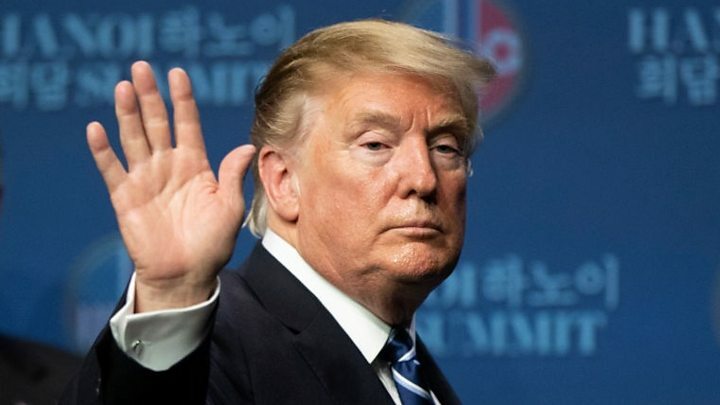 According to Mr Trump, Mr Kim made a significant offer – to dismantle all of the Yongbyon complex – the research and production facility at the heart of North Korea’s nuclear programme. But in return Mr Kim wanted all sanctions lifted, something the US was not prepared to offer, Mr Trump said. There was also a question over the network of facilities that extend beyond Yongbyon. Last month, Stephen Biegun, the US state department special representative for North Korea, said Pyongyang had committed in pre-summit talks to destroy all the nation’s plutonium- and uranium-enrichment facilities, dependent on unspecified US measures in return. Those unspecified US measures appear to have been complete sanctions relief, which Mr Trump would not offer. 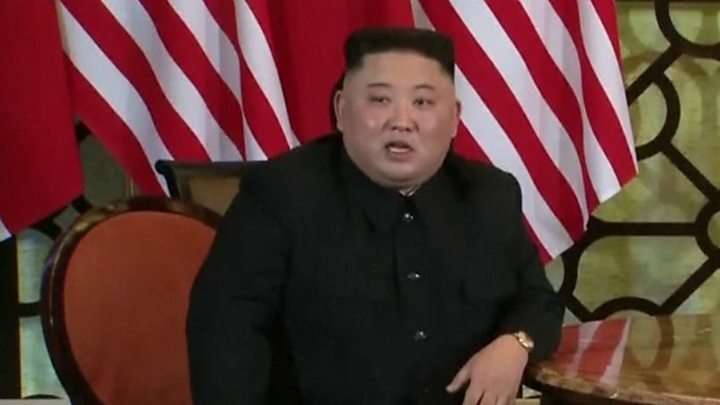 The US president also suggested in his news conference that Mr Kim had offered only the destruction of Yongbyon and not North Korea’s entire nuclear apparatus. Yongbyon is North Korea’s only known source of plutonium but the country is believed to have at least two other facilities where uranium is enriched. The president said that when he raised the issue of a second enrichment facility apart from Yongbyon, the North Korean delegation was “surprised” by what the US knew. There is uncertainty about what exactly both sides mean by denuclearisation. 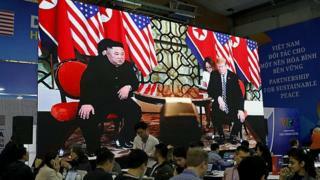 Washington has previously said North Korea must unilaterally give up its all of its nuclear weapons and destroy all of its nuclear facilities before there can be any sanctions relief, but that condition is known to be a sticking point for the North Koreans. It is thought Mr Kim views denuclearisation as a mutual arrangement in which the US withdraws its military presence on the Korean peninsula. Mr Trump said the US delegation “had some options and this time we decided not to do any of the options”.